The 2nd Robot Survival Game took place at ASOBITCITY in Akihabara, Tokyo on Sep 11th, 2010. Variety of robot, not only multi-legged robot such as 4-legged, 5-legged, 6-legged with wheels but also mobiles such as tank with 4-wheels or caterpillars joined the game. The organizer who were Tanaka-san (Dainihon-giken) and Bishii-san (Asakusa-giken) announced on Dec 4th, 2009 that they began to make multi-legged robots for robot survival game with toy gun and sensor for detecting the impact, which were controlled using image monitor such as Mech Warfare in U.S.A. The movement of making multi-legged robot in Japan began from this announce. Recently multi-legged robots joined the 11th International Space (MARS CHALLENGER) Contest on Aug 29th, 2010. Trials were held twice for getting information of the robot survival game such as gun-shoot range of height and radio control and camera system without confusion on April 10th and June 13th. The 1st Robot Survival Game took place at the at ASOBITCITY in Akihabara, Tokyo on July 19th, 2010. (1) Mobile bodies are not only multi-legged robot or biped robot but also mobile with wheel or caterpillar. (2) Weapons are toy-gun under 0.1 J and/or the other shooting system. (3) Equipped stopping mechanism of the body by gun-hit sensor using a solar battery covered with tinfoil (6 x 6 x 6 cm cubed or 5 x 6 x 7 cm). (4) Robot control has to be done with the image on PC from the camera attached on the robot. (5) Participants have to handle toy-gun carefully and put protector on eyes. In the 2nd Game, every robot attatched a dead marker colored team color which was made by Tanaka-san as follows. 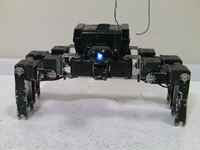 `Vanga`, 6-legged with wheels robot was custom-built by Igaa. It could move very fast using wheel system. `Arnold Stallone`, 4-legged turtle robot with KCB-3WL, which was a new board for remote controlling robot system from KONDO by watching image around the robot on PC, with double guns system was custom-built by Noborizaka. `Osaru-2.5gou`, mobile with caterpillars attached a rubber band frotress was custum-built by Osaru. 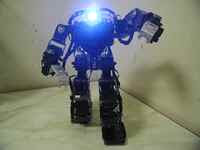 ` BLACK TIGER L45`, 5-legged robot was custom-built by IKETOMU. `Yabusame`, 4-legged robot was custom-built by Mota. `Denryu’ with 4 wheel body was custom-built by gons. `Goryu`, mobile was custom-built by Koizumi. [Team game] Each team has territory. Robots can put in each territory field at the beginning of the game. Game time is 5 minutes. 1. Extermination Fight (Destroy the enemy completely). Each team fights to destroy the enemy completely within 5 minutes. The winner team is having larger number of survival robot after 5 minutes. 2. Flag Fight. Each team fights to shoot down flag in the enemy territory. The winner is the team shot down the enemy flag within 5 minutes or the team which has larger number of survival robot after 5 minute in the case of each flag does not shoot down within 5 minutes. [Duel Fight] Just 2 robots fight in the field. Using of field and fighting time is free. The 1st Game: Extermination game (Destroy the enemy completely), without camera system. Vanga, BT-L45 vs Osaru2.5, Arnold Stallone. The 2nd Game: Extermination game (Destroy the enemy completely), without camera system. Vanga, BT-L45 vs Osaru2.5, Arnold Stallone. The 3rd Game: Extermination game, using camera system. Vanga, BT-L45 vs Osaru2.5, Arnold Stallone. The 4th Game: Flug game, without camera system. Vanga, BT-L45, Yabusame vs Osaru2.5, Arnold Stallone. The 5th Game: Flug game, without camera system. Vanga, BT-L45, Yabusame vs Osaru2.5, Arnold Stallone. The 6th Game: Fight a dual; Vanga vs Genryu. The 8th Game:The General Fight; Vanga, Denryu and Goryu. After the 2nd Robot Survival Game, some attendants joined the Kanto-gumi Trainning Mettting, taken place at Tokyo City University. Practice of robot survival game was carried out under the mosquito net. Combat Shooting is practice game for trainning of shoot skill. Player moves to the No.1 shooting place from the starting point and push down the 1st pole and then shoot the 1st target. After shooting down the 1st target, player moves to next place and push down the 2nd pole and shoot the 2nd target. Winner is the shortest time player for shot down 3 targets. The target is a cut 1 L milk paper pack. Combat shooting was carried out using camera system by Osaru2.5. Fight with 3 robots, BLACK TIGER L45, Yabusame and Osaru2.5 took place without camera system. The winner was Osaru2.5. The details were also described in Sanzai-san's blog and Tanaka-san's blog (in Japanese). I have been enjoying biped robot since 2004, when KHR-1 was put on the market, and collecting information of hobby robots. 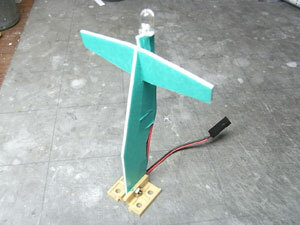 I would like to upload information about hobby robots in Japan for the hobbyists of biped robot all over the world. As my ability for uploading is limitted, I will introduce just news of product, kit or parts and information of competition etc. with picutures or videos.